Welcome to Pipe Babes 2015! To see the archives of Pipe Babes from 2014, look here, from 2013, look here, from 2012, look here, or from 2009 - 2011, here. This is Alli's first appearance as a Pipe Babe. In this shoot, she is smoking a vintage pipe marked Gefapip #35 Tignes France. It's a French factory-made piece that goes beyond the shaping borders by including a Danish-style acrylic mount. Even though the bowl has a flat bottom, the weight of the stem embellishment does not allow it to sit. Alli thought it was one of the prettiest pipes in Lori Brown's collection and chose it for this scene. Alli has her Bachelor's from the University of Florida in Advertising and has a deep interest in rehabbing houses and restoring old furniture. She is a real estate agent and has also been bartending for over 11 years. She enjoys running with her Pointer-Pit Bull mix and enjoys spending time with friends and family in her off time. Thanks to Central Cigars in Downtown St. Petersburg, Florida for providing an elegant smoking location. Photos by Diana Atwood of D. Atwood Photography. Kalie is the mother of two little boys that keep her very busy. She has lived in Utah her entire life, and works as a sales assistant for a marketing company for the last 16 years. She likes to read, garden and work with her hands. 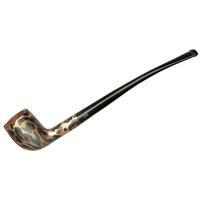 She is a pipe smoker in real life, and smokes a pipe almost every day. She says; "As far as pipes go, I love my briars but I'm a cob girl at heart." This is Melania's 3rd feature as a Pipe Babe. 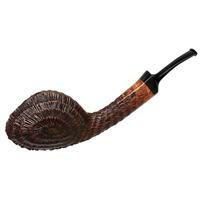 She is smoking a Godbee / Heeschen Pipe. 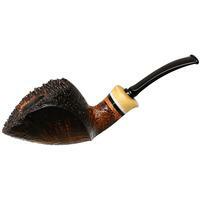 In July 2010, PipesMagazine.com Publisher, Kevin Godbee stayed overnight at Pipe Artisan Peter Heeschen's house in Denmark, and made his own pipe in his workshop, albeit with lots of help. Melania is a 22-year old student, a professional ballroom dancer and last year held the title of Queen of the National Floral Games of Mexico, which is a poetry contest held in one of the most important oil hubs in Mexico. She has won several international dance competitions. Born in Mexico and raised overseas, she is truly a third culture kid. She is fluent in English, Spanish and Mandarin-Chinese, reflecting her formation as a child. She is currently pursuing her degree in Oil and Gas Accounting. This shoot was done at Central Cigars in downtown St. Petersburg, Florida, a full liquor and cigar bar with several name brand cigars and their own house blends as well. It is attached to Ruby's Elixir which is a great Jazz & Blues club. Smoking is permitted not only in the cigar lounge, but in the jazz club as well. Photos by Barry Lively of B. Lively Images. This is Gina's third appearance as a Pipe Babe, and she has also been interviewed on The Pipes Magazine Radio Show. Gina is a full time musician with an album of her own original acoustic guitar songs. She is self-taught, and has a quite unique style of playing the guitar. Check out her impressive skills and style in this YouTube Video. She also performs live almost every week at various locations in Southern California, and she is a pipe smoker in real life. You can hear her interview on The Pipes Magazine Radio Show here. Please welcome back Pipe Babe Coley for her 2nd appearance. We introduced you to her in December 2014. Coley has beautiful, luxurious, long hair down to her derriere, and she frequently serves drinks to PipesMagazine.com publisher, Kevin Godbee. Coley has been bartending for 14-years, and is a Florida native. With the hot, humid FL weather and her long hair, she frequently puts it into a ponytail, which is named Penelope—Godbee's martini-fueled idea. Speaking of names, her pet Yorkie is named Mr. Oliver Ruggles. Coley hopes to retire by owning a doggie daycare "so I can play with furry babies all day long." When she turned 30, she got rid of all of her belongings and drove to California and back "just to see the country." She has a passionflower tattoo on her left wrist, her favorite band is Pink Floyd, and her hair is naturally purple. This shoot was done at Central Cigars in St. Petersburg, FL. 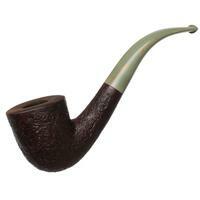 Coley is smoking a Dunhill 1961 Shell Briar (Group 4) pipe from Godbee's personal collection. Photos by Barry Lively of B. Lively Images. Hair & Make-up by Brittany Addison. In this shoot she is smoking a Comoy's Tradition Pipe (1950s-era) from Kevin Godbee's collection. This shoot was done at Central Cigars in downtown St. Petersburg, Florida, a full liquor and cigar bar with several name brand cigars and their own house blends as well. It is attached to Ruby's Elixir which is a great Jazz & Blues club. Smoking is permitted not only in the cigar lounge, but in the jazz club as well. Photos by Barry Lively of B. Lively Images. Hair & Make-up by Brittany Addison. This is Melania's 2nd feature as a Pipe Babe. She is smoking an Adam Davidson pipe from Kevin Godbee's collection. 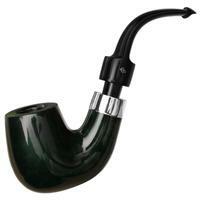 The pipe is a 2013 Military Mount Billiard with Silver Band. Melania is a 22-year old student, a professional ballroom dancer and last year held the title of Queen of the National Floral Games of Mexico, which is a poetry contest held in one of the most important oil hubs in Mexico. She has won several international dance competitions. Born in Mexico and raised overseas, she is truly a third culture kid. She is fluent in English, Spanish and Mandarin-Chinese, reflecting her formation as a child. She is currently pursuing her degree in Oil and Gas Accounting. This shoot was done at Central Cigars in downtown St. Petersburg, Florida, a full liquor and cigar bar with several name brand cigars and their own house blends as well. It is attached to Ruby's Elixir which is a great Jazz & Blues club. Smoking is permitted not only in the cigar lounge, but in the jazz club as well. Photos by Barry Lively of B. Lively Images. Hair & Make-up by Brittany Addison of Create Salon. We were introduced to Gina Roode last year, and we are thrilled to see her return as the April 2015 Pipe Babe of the month. Gina is a full time musician with an album of her own original acoustic guitar songs. She is self-taught, and has a quite unique style of playing the guitar. Check out her impressive skills and style in this YouTube Video. She also performs live almost every week at various locations in Southern California, and she is a pipe smoker in real life. You can hear her interview on The Pipes Magazine Radio Show here. Zoie is Smokin' ... Literally and Figuratively! Camae is a bubbly, petite, cutie with beautiful, long, flowing brown hair. Originally from New York, and now residing in St. Petersburg, FL, this 28-year old Virgo enjoys smoking a pipe on special occasions. You may also see her smoking a cigar at Central Cigar Bar in downtown St. Pete. In this shoot, Camae is smoking a Savinelli Spring 626 Smooth Billiard, and using a IM Corona Old Boy Sandblasted Briar Lighter. Thanks to Joe Sale for letting us use his studio with the cool backdrop of the Brooklyn Bridge. Photos by Barry Lively of B. Lively Images.